Join us Saturday, February 23 at 7 p.m. for our annual gala!. Please join us for our annual back-to-school Parents Night out ! (adults only, business casual attire). Join us on Saturday, August 25 at Dante Fascell Park, 8600 SW 57 Ave in South Miami, in the large pavilion for a back to school picnic! Bring your own picnic ! 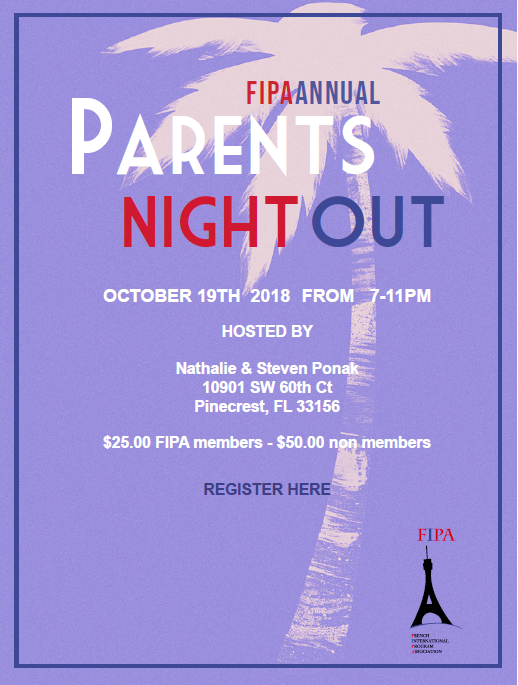 Join other FIPA parents on Friday, November 3! The picnic has been rescheduled due to the heavy rain. Have a wonderful weekend, and please plan to join us on our new date, SATURDAY, SEPTEMBER 9, 11 a.m. - 4 p.m. at Crandon Park's South Beach! FIPA Tous A La Plage! Join us for our welcome-back beach picnic! Meet your classmates and other FIPA families. Enter using the south entrance, go toward the beach and look for the FIPA French flag! Bring your beach umbrella, beach chairs, and something to share. See you there! Join us for our annual general meeting at Coconut Grove Elementary School in the auditorium at 6:00 p.m.! FIPA needs your involvement today more than ever! If your children attend one of the above-mentioned schools, it is very important that you attend the upcoming FIPA general meeting and elections. Come to learn about the reasons why your action is deeply needed all year long to support the French IS Program in our schools so that we can help to maintain and improve the quality of our children's bilingual education. Everyone is able to contribute something, in some way. It is not only the duty of others to ensure the future of your students--we are most successful when everyone takes a share of the work. We hope you'll be able to give one hour of your time on March 22. Meet us in the auditorium at Coconut Grove Elementary School at 6 p.m. Ask questions, understand what is going on, and learn about what FIPA is doing for almost 1,000 students in 1st to 12th grade. Find out how you can help and become part of the action. Board Members for the 2017- 2018 school year will be elected at the end of the meeting. Consider becoming part of our great team! We hope to see you all there. Join us at the residence of the French Consul in Miami on Saturday, February 25, to support the French International Studies Program in Sunset Elementary, Coconut Grove Elementary, Carver Middle, ISCHS and ISPA. The gala is SOLD OUT! See you Saturday! Mr. and Mrs. Candido Creis Estrada, Consul General of Spain in Miami, and Mr. Alejandro Perez, ISPA Principal, and Mrs. Nicole Unternaehrer, ISPA PTSA President, cordially invite you to International Studies Preparatory Academy's Annual Mediterranean Parents' Cocktail. Friday, February 10 at 7 p.m. at the residence of the Spanish Consul General, 3600 Granada Boulevard, Coral Gables, Florida, 33134. Tickets required. You can treat your special someone to a Valentine Gram or Cookie delivered to their classroom on Monday February 13th, 2017. You may send your money and greeting to the French Department in an envelope by February 10th. There will be a special collection table at the school entrance every morning from 7:30 to 8:30 am the week of February 6th to the 10th.